If you’re new to the podcast, welcome. For businesses, I focus on helping entrepreneurs hit the trifecta of business building: 1) getting new customers, 2) serving existing customers better and 3) not going crazy in the process. Today’s show is about that third leg of the trifecta. In the last 48 hours or so Ohio State head football coach has encountered some major trouble regarding a longtime assistant coach on his staff who it seems habitually abused his wife. Ohio State has put the head coach, Urban Meyer, on paid leave while they investigate his role in hiring and keeping a known abuser. Just another case of seemingly low integrity behavior. Compromising morals, ethics and even legality can tempt any of us. Maybe high achievers more than most. The pressure to stay at the top is intense. I’m sure coach Meyer, who delivered one national championship to Ohio State was annually feeling the pressure to repeat the performance. I’m not excusing it, but I’m not naive enough to act like it can’t happen to you, or me. We can all fall prey to foolishness because these temptations can cause our compass to spin out of control. We lose our bearings when we surrender to poor behavior. Low integrity activities take a heavy toll. Coach Meyer may not survive this ordeal. From sexual misconduct to cooking the books, from illegal hiring practices to paying people in cash off the books…there are many paths to low integrity practices. Greed and ego provide much of the fuel. The proof is found in the powerful people who have suffered great falls, likely because they felt their power would prevent them from ever suffering for their foolishness. I could approach the topic from a conviction or faith perspective, but let’s just approach it from a practical, business viewpoint. Yes, I’m going to make a few simple assumptions. For starters, I assume you’re uninterested in breaking the law. Secondly, I assume you don’t find pleasure in living on the edge, wondering if the IRS or FBI or some other governmental agency is going to come knocking. Doing the right thing is always right. I’ll assume you agree with that, or you’re at least open to it. I hope so. For instance, a man who will cheat on his wife will certainly cheat me if I’m doing business with him. Yet so many people live as though they think a person is a “good” person, even when that person (in this case the cheating husband) does something “bad.” I’m not talking about perfect people because none of us are. But I am talking about people committed to good, decent, ethical and moral behavior. And I choose to think most of us prefer to live that way, even if we sometimes slip up. Rather than focus on the pain that our poor behavior might cause, let’s flip it around and focus on the wonderful benefits of behaving with the highest integrity. Weight loss advocates have long used a moniker that resonates with folks trying to drop some weight. “Nothing tastes as good as thin feels.” There’s no debating that many (if not most) things that are bad for weight control (or loss) taste pretty terrific. But the saying emphasizes the longer term over the short-term. Go eat a bucket of your favorite ice cream and it’s pretty stinking wonderful. It just doesn’t last very long. But the 4,500 calories you consumed will remain with you long after your taste buds have been satisfied. So it is with low integrity versus high integrity behavior. The price is too high, and just not worth it. Urban Meyer can have just about any assistant coach he wants. Why tolerate having a man on your staff who beats his wife? Frienship? Loyalty? Why would a leader compromise his own integrity and put his own career at risk for such poor behavior? I can’t say with certainty, but I’ve got some ideas. One, we don’t think we’ll be found out. We can be tempted to make a poor choice because we don’t think it’ll matter. Nobody will find out. Besides, in the case of this football coach, it’s not OUR behavior. Guilt by association? He probably felt that wasn’t likely. Three, we want what we want, when we want it. In a word, it’s selfishness. It’s about us. We want the money, the advantage, the benefit. It can blind us to the realities of negative consequences because we’re so focused on the benefit. Like that bucket of ice cream…it tastes so good. And when our waistline expands, we’ll just buy bigger pants. It’s Friday so we may as well ruminate about some highly valuable long-term things, right? You have convictions. How negotiable are they? Will you compromise them? Ever? Think more seriously about them. Is there anything that can influence you to surrender a conviction? A circumstance that might cause you to violate it? The same could be said about compromising our integrity. I’m betting coach Meyer wishes he’d never hired a guy who beat his wife. I’m betting all the big time corporate leaders who have fallen recently due to improper conduct wish they’d never started down whatever path led to their fall. Sexual harassment. Spousal abuse. Employee abuse. Unethical and immoral behavior require a price. A cost. And it’s often much, much higher than we ever thought possible. 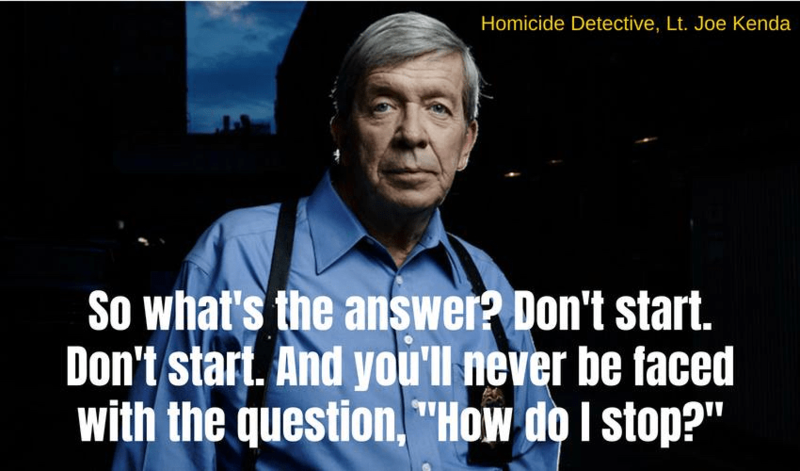 Perhaps the key, besides what Lt. Kenda says, “Don’t start,” is to forget about the short-term gain. If we pass on eating the bucket of ice cream we forego a few minutes of tasting something great. But we also forego adding more inches to our waist, creating something we’ll have to live with much longer than a few minutes. And the pain we’ll have to endure to get rid of those inches is a really high price for momentary pleasure. Hint: If you ask yourself that question, give serious consideration to quickly kicking it to the curb. That way you can avoid the temptation to do something foolish and stupid. It’s why I end each show with 3 admonitions. The second one speaks to the topic at hand.